Rait Castle, residence of the brothers, Sir Gervaise and Sir Andrew de Rathe, and their later families from around 1150-1405, stands two miles south of the highland town of Nairn, itself about sixteen miles east of Inverness. An early note mentions that on the East side of the hill of Geddes, are the remains of Rait Castle, which is said to have been the residence of a branch of the powerful family of Cumyn. Rait is not a castle but a 'hall house', a style common in the 13th century. Rait is one of only a handful of such castles still standing in Scotland, and the only one which is complete to the wall head and has no later additions. No longer visible beneath the vegetation are a courtyard (with walls recorded as nine foot high in 1957) and the remains of the Chapel of St Mary of Rait. In recognition of its historical importance, Rait Castle is protected under the ancient monument act. The ghost of a girl with no hands is said to haunt the ruins. These pages will describe places associated with the name Raitt in its various forms, together with some of the people who occupied the castles, mansions and villages. Rather than having one long page, the information has been divided into five parts - the first (below) dealing mainly with the architecture of Rait Castle; a second page recounting some of the stories associated with Rait Castle Owners and Occupants; a third segment giving an overview of the lands of Rait; a fourth part describing some of the other main residences of various Raitt families (such as Hallgreen Castle, Anniston House, Red Castle, Dunnottar, Drumtochty and Raith House), and the fifth covering other places associated with the name Raitt - such as Rait village in Perth, the deserted village of Raitts in Nairn, and Raith in Ayrshire. In addition, a few details are provided in this last part as background for Rhaetia from whence some consider the Raitts to have originated centuries ago. A new page has also been created which gives many photographs of Rait Castle. See also the blog entry on the Castles of Rait. 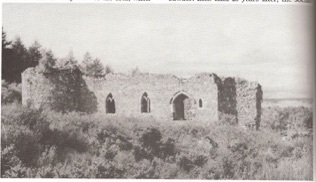 Rait Castle, a rare example of a small stone hall-house of early 14th century, examined by Stewart Cruden and Prof Simpson 1957. It occupies a bad defensive position, overlooked from south by a rough irregular knoll. Slight traces on N side of castle suggesting an enclosing ditch. The hall measures approx 54ft by 22ft and up to 36ft in height, with walls nearly 6ft thick. A round tower projects from one corner and there is a garderobe tower which projects nearly 13ft on W side and is 8ft wide. The portion of a wall embedded in E gable is older than hall-house and is probably a remnant of an older manor-house. The long tenement on W side is older, too, as it appears to have been shortened to make room for hall-house. Between hall and knoll to S is courtyard, S wall of which incorporates a steep, smooth granite outcrop about 8ft high and 80ft long. It is constructed of similar materials to hall-house and stands to a height of 9ft and 2.5ft thick. The detached building, 32ftx 16ft, SE of hall-house, is possibly chapel of St Mary of Rait, or Hermit's Chapel. In 1343 Nicholas the Hermit was in occupation and records exist of a chapel c1189-99. The last recorded reference to a castle on this site was 1596, excepting mention of Castledown of Rait in 1622. W D Simpson 1937; 1961; S H Cruden 1960. 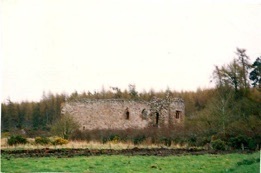 Rait Castle, now undergoing restoration and possible remains of chapel of St Mary of Rait, or Hermit's Chapel, are as described and planned by Simpson. To E of castle remains of a minor depopulated settlement, comprising several buildings with attached small enclosures, which may or may not be associated with castle. Visited by OS (N K B) 12 January 1967. There are not many recent books or documents on Scottish castles that describe Rait Castle in other than a few lines. One of the few that does is Land of Castles by Leonella Longmore and published by The Inverness Courier in 1993. In the six pages, not only are the surroundings and architecture of the castle described, but also its turbulent history. 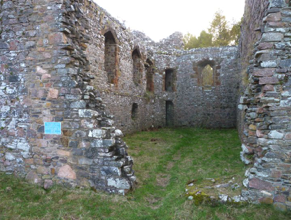 According to the author’s text, Rait castle, dating from the 13th century, was the work of Sir Gervaise de Rait and his younger brother Sir Andrew, both of whom were prominent supporters of Edward I, and possessors of one of the oldest Thanedoms in Nairnshire. The earliest recorded owner was Shaw, the fourth chief of the Mackintosh clan, who before 1265, had obtained a grant of Meikle Geddes and the Castle of Rait [but if the Castle already existed at this time, then perhaps Gervaise rebuilt it in the stone we see today rather than original wood?] Longmore goes on to say that the de Raites propensity to side with the English may explain the unique features of the dignified ruin - which is unlike any other castle in the area. The pointed, ornamental Gothic windows of the first floor give an immediate impression of the ecclesiastical, contradicting the defensive quality of the small square apertures and narrow loopholes on the ground floor. The author continues that it is evident that this is a building of a class superior to the ordinary keeps that abound in the North of Scotland. Radically different from the towerhouses of neighbouring Cawdor and Kilravock castles and vastly superior to Inshoch, Rait seems to have been built by a master mason par excellence, one seemingly familiar with the fine, ecclesiastical, Gothic building that was going on in Moray during the 13th century - such as in the Abbeys of Elgin, Pluscarden and Kinloss. 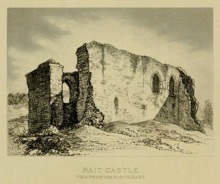 Notwithstanding its ecclesiastical nature and its Hermit’s Chapel, Rait was never a church for there are frequent references to “Rait with its fortalice” and to the “Castletown of Rait”. The Castle Scotland website provides yet another perspective of details about Rait Castle. “The living accommodation was at first floor level and access to the round tower is at this level. The windows for daylight are located to the North not because of the level of light offered but because they are located higher above ground level. 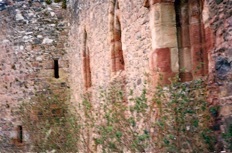 There is evidence of a courtyard and barmkins (outerwalls) that must have been removed for local buildings. The main feature of Rait Castle is the round tower with vaulted roof. Although there is no evidence of a means of supporting joists at first floor level, there must have been accommodation at this level due to the stone window seats of the mullioned window. Near the entrance via the bridge a there is a large fireplace. The jambs of the entrance are grooved for a portcullis and the sandstone arch over is raised to make a feature of the opening. A door existed inside the portcullis, evidenced by a pocket at the jamb which would have received a bar of timber or metal to secure the door against entry. The window openings, except the narrow slits of the tower all have evidence that they were barred to keep unwanted visitors at bay. One odd feature which stands out, is that the walls all measure 5'-6" in thickness, except the thinner East gable which is now partly removed. It is unclear why this East wall was not built to the same thickness. The courtyard is bounded by a steep rock to the South and the castle to the North. The stone work around the windows were worked by craftsmen of some skill, using ornaments more often found on English castles. It is doubtful if at the time the castle was constructed that these skills would have been available locally. There appears to be evidence of a toilet which was corbelled out on the North side at first floor level. The article goes on to look at the various Rait personages in history. Simpson’s dating implies that Gervaise de Rait and his brother Andrew did not occupy Rait Castle since, in his view, it was not built at the time they lived. However, following his essay, Simpson was strongly challenged on the date by Herbert Honeyman (a distinguished authority on the medieval architecture of northern England) who refused to believe that Sir Gervaise de Rait - a man of some prominence, a courtier as much at home in England as in Scotland, a possible relative of the John Comyn who crenellated his well-built stone camera at Tarset in 1267, could have been content to live in a 'timbered earthwork' and thus, in Honeyman’s view, the castle must date from the thirteenth century and been built during the reign of Edward I. 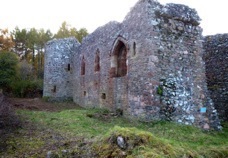 Indeed, the Thanedom of Rait was one of the oldest manors in Nairnshire is first on record among a list of estates in the bailiewick of Nairn in the year 1238. Accordingly Simpson thoroughly re-examined Rait Castle in 1957 comparing similar architecture elsewhere in Scotland (at Duffus and Morton) and wrote a follow-up paper on his findings which was published in the Proceedings of the Society of Antiquaries of Scotland for 1958-1959. His new survey convinced him that the building was an excellent and (in Scotland) exceedingly rare example of a small medieval stone hall-house, and that its date must be placed quite early in the fourteenth century, during the Plantagenet occupation. He put forth several conclusions and stated that if they were accepted, then Rait Castle emerges as the work, in all probability, of Sir Gervase de Rait, or of his younger brother Sir Andrew de Rait, both of whom were prominent supporters of Edward I during the Plantagenet occupation. Close by Geddes is Raite Castle. Here is an old Fort, built in the form of a square, which was anciently the seat of Rait of that Ilk, who, having killed Andrew Thane of Calder about the year 1404, was banished that country, and founded the family of Raite of Halgreen in the Mearns. A part of Raite was Calder’s property in 1442 (Pen. Cald); another part of it with Meikle Geddes, was the property of Ogilvie of Carnoustie, from whom Sir John Campbell of Calder made the purchase anno 1432 (Ibid). Two miles east of Cawdor, and near the House of Geddes are the ruins of Raits Castle, anciently the seat of the Macintoshes of Raits. The castellated part is gone, but a religious edifice, apparently of a more modern date than it could have been, remains. At the south corner it is terminated by a round Tower (lately formed into a dovecot) resembling those attached to the bishop’s pala265) ce at Kirkwall and Spynie. Close by is a small but interesting vitrified fort, called Castle Finlay. 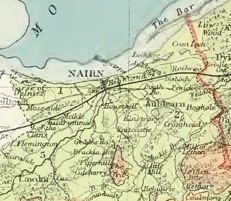 Elswhere in the same volume it is noted by Shaw that Sir John Campbell of Calder, in 1533, purchased from John Ogilvie of Carnoustie, Meikle Geddes, Raite, and the Fort of it (Pen. Cald). Sir Hugh (Calder?) 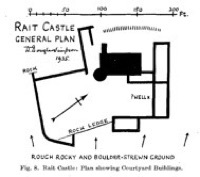 purchased Raite Castle and Raite Lone from John Iloy of Lochloy in 1678. 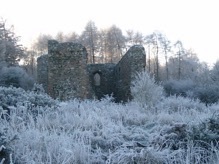 Two miles east of Cawdor and three quarters of a mile east of Geddes House are the ruins of Raits Castle, anciently the seat of the Macintoshes of Raits, and prior to that of a branch of the Cumyns, and also, it is said, of the family of Rait of Rait, which disappeared from the county in the end of the 14th century, and became, the founders of the family of Rait of Halgreen in Kincardineshire. The last of the Nairn family was Sir Alexander Rait, who, between 1395 and 1400, murdered the then thane of Cawdor. There seems also to have been at an early date a chapel here dedicated to the Virgin Mary. 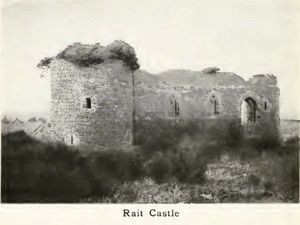 In yet another similar description by Charles Matheson in his book on Moray and Nairn, published in 1915, it is noted that “Rait Castle, situated at the foot of the Hill of the Ord, about three miles south of Nairn, has proved a great puzzle to antiquarians and architects, owing to the very exceptional modifications of the keep plan. Thus, the windows are pointed and show Gothic arches and mullions. In many ways the building suggests ecclesiastical rather than castellated architecture. On a close examination, however, distinct traces of the grooves of the portcullis are seen. Further evidence of the defensive equipment is found in the fact that the tower was so situated as to protect from the south, the side most open to assault. The castle is believed to have been erected early in the fifteenth century. Writing in the Proceedings of the Society of Antiquaries of Scotland in 1937, W. Douglas Simpson also gives a very detailed description and discussion of Rait Castle, noting that whilst it might occupy an exceedingly fine situation, from the standpoint of defence the position of the castle is a wretchedly poor one. The illustrated article contains a wealth of detail much of which is contained in the other descriptions on this page and is thus not repeated here. However, the author states that there is nothing quite like it (i.e. Rait Castle) in Scotland. It is an excellent and early example of the "palace" plan, introduced into Scotland in the latter part of the fourteenth century and is radically different from the towerhouse plans which were more usually in vogue in Scotland at this period. Simpson spends some time in an attempt to work out the date and affinities of this important building. 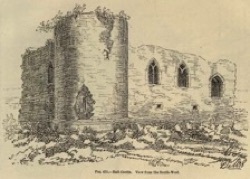 He argues that there must have been a school of highly skilled masons in the area who exerted an important influence on the lay architecture of the district (in addition to church buildings) from the moment that stone castles began to supersede the timbered earthworks which the first early Anglo-Norman settlers threw up. That this was the case at Rait no one who has studied the building can doubt for a moment. He goes on to note that it is obvious that its master mason was a man of high professional standing, and familiar with the fine Gothic building which was going on at the neighbouring ecclesiastical sites (indeed the south jamb of the southwest loop shows a freestone quoin, re-inserted, on which is incised a large sigma-shaped mason's mark, about 4.5 inches long.). Simpson has little doubt that Rait Castle (along with that of Duffus and the church of Barevan) were all built by the same masons, and that their date falls towards the end of the fourteenth century. These three buildings thus form a group the interest of which is not surpassed in the north of Scotland. 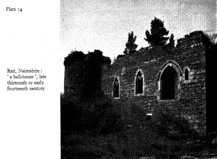 Although there are several books that describe Rait Castle and its occupants in some detail, the information provided, even though it may duplicate somewhat, is nevertheless of value for the simple reason that all the descriptions and associated images have taken place at different times and been written by different authors - even though some original text might have been consulted. Thus we can build up a picture of how Rait Castle looked over the years, especially when it was less ruined than it is now. A more recent book is that of Stewart Cruden entitled The Scottish Castle and published by Nelson in 1960. Although Rait is compared to other castles (as other books do), there is a substantial passage on the ruins. “Rait (pl. 14 ; fig. 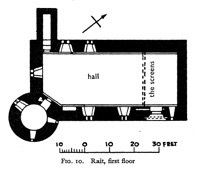 10) is an oblong hall over an unvaulted undercroft. A round tower rising from a spreading base projects from one corner. The elevated entrance led into a screens passage separated from the hall by a timber screen, now vanished, as at Morton. Off this a small lancet window permitted the porter to observe the approach. The doorway is arched in receding orders of broad splays beneath a label mould. A portcullis and draw-bar secured it. As at Morton baronial pride and caution are here combined. The doorway is greatly overdrawn, of immoderate size in relation to the modest hall it serves and to the elevation in which it is placed. Evidently the hall-house borrows from the castle when it can. At the far end of the hall is a hooded fireplace with sconces, one on either side. 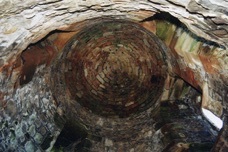 This late thirteenth-century feature is ubiquitous in Edward's castles of North Wales, but uncommon in Scotland, although present at the hooded fireplace of Tulliallan, another of this group, which is especially distinguished by a splendid undercroft, rib-vaulted from central piers, an achievement without parallel in Scottish secular architecture. Two twin-light arched windows with pierced spandrels and ribbed soffits to their arched embrasures lit the dais end at Rait and did duty for the traditional oriel. In conjunction with the fireplace and adjacent entrance to the projecting tower, which afforded private withdrawing-room or solar accommodation, they make a tidy unit of planning which is closely paralleled at Morton. The tower is covered with a saucer dome of concentric rings of masonry. From the rear elevation a narrow garderobe tower projects as at Tulliallan and Roy. The undercroft, like that of Morton, is lit by squarish windows with chamfered edges high up in the wall. This style occurs at Lochindorb in the late thirteenth or early fourteenth century, and of this date they are presumptive evidence elsewhere. Rait carried a long pitched roof coming down to the wall-head of the hall along the sides, but the gables of the roof were set back behind an overhanging parapet at each end. Against the east gable there seems to have been an attached outbuilding, probably of timber and clay, communicating with the screens passage. As in neither the Morton undercroft nor in that at Rait was there a fireplace, the ancillary buildings attached to both were of no great substance nor architectural importance, and in all probability consisted of kitchen and storage. The building is divided into two floors. The ground floor is provided with several small square windows, varying from 12 inches to 18 inches in width. The one nearest the north-east angle is a loop with a pointed arch. There is no fireplace in the basement. The doorway led by a passage or guard-room, not to the ground floor, but to the hall above, which is lighted with the handsome windows already described. These windows are furnished with stone seats and the hall provided with a large fire-place. From the hall, the round tower is entered, and it is found to contain a private room. The remains of the tower rise a few feet higher than the existing walls, which are about 20 feet in height, and when entire doubtless terminated in battlements. The object of the tower is plainly to defend the building from attack from the mass of rock rising to the south—the most easily assailable point. The tower bears a close resemblance to the round towers of the Edwardian period. There are no mouldings or ornaments to give a clue to the age of its erection. The walls are 5 and a half feet thick, built mostly of fragments of the adjacent rocks, except where freestone is used for the door and window finishings, and all strongly cemented together. As noted under Rait Castle Owners, George Bain in his History of Nairnshire (1893) provides much information on the Raites of Raite. He goes on at some length to describe their edifice as follows. “The ruins of Raite Castle which still remain are situated at the foot of the Hill of the Ord. The building, though roofless and completely gutted, exhibits several features of detail which have greatly perplexed antiquarians. It is in some respects almost unique in Scotland. The shape of the building is that of a simple oblong, 64 by 38 feet, with a round tower, 21 feet in diameter, at the south-west angle. Viewed from the outside, the building has a decidedly ecclesiastical appearance. The windows are not mere slits in the walls, but are three feet wide, with Gothic arches and mullions. McGibbon and Ross (see above), who give a minute description of the architectural details, say that the windows are of a form and design very uncommon in Scotland, This aspect of the exterior has led some writers to conclude that the building was an ecclesiastical edifice. An examination of the interior, however, does not support this view. The entrance, which is at the east end of the south wall, still shows the grooves of the portcullis by which it was protected. The doorway, which is in the form of an arch, was further protected by a wooden door, as is evidenced by the jambs still remaining. "The form of the arch," say the architectural authorities already quoted, "is very unusual and the workmanship is superior to that of ordinary castles." “There is no account of the origin of this interesting and almost unique building. It stands on a hillside about three miles south from the town of Nairn, and commands the level and fertile country between it and the Moray Firth. Tradition says that it belonged first to the Raits of that Ilk, and afterwards to the Comyns. In plan (Fig. 474) this castle is a simple oblong, 64 feet by 33 feet over the walls, which are 5 feet 6 inches thick, with a round tower, 21 feet in diameter, at the south-west angle only. The only entrance to the castle seems to have been on the first floor near the east end of the south wall (Fig. 475). The doorway is still entire, and has portcullis grooves near the outside, with jambs for a wooden door within. The form of the arch is very unusual, and the workmanship is superior to that of ordinary castles. This doorway appears to have led directly into the hall, or there may have been a guard-room screened off at the east end, forming a passage to the hall. The hall is lighted with windows of a form and design very uncommon in Scotland. They are all about 3 feet wide, have pointed arches, and are furnished with mullions and stone seats. 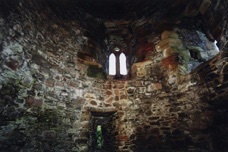 The round tower enters off the hall, and contains a private room, which also has a mullioned window. The arch of all the windows has been filled with the simplest kind of tracery, formed by the mullion branching at the impost, with a pointed arch to either side. The ingoing of the windows is roofed over with a depressed arch, having two ribs in the depth (Fig. 474). There are no mouldings in the building to give an idea of its date ; only plain splays are used. The ruins of a projecting garde-robe, somewhat like that at Tullyallan, remain at the north-west angle (Fig. 476). The ground floor is lighted with several small square windows, varying from 12 inches to 18 inches in width. That nearest the north-east angle is a loop with a pointed arch. There is no fireplace on the ground floor, but the hall has a plain one. The building was no doubt three stories in height, but the walls of the top floor have now been removed. 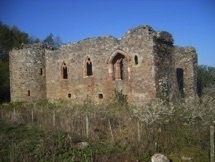 This building possesses several features which recall similar ones at Tullyallan and Morton Castles, which indeed are almost the only other buildings with which it has affinity. The simple oblong shape, the door on the first floor with its portcullis, the character of the window recesses, and the small square windows of the basement, have all a certain similarity to the corresponding features of the above castles. Like Tullyallan, this may have been a grange or mansion rather than a castle, although still to a certain extent provided with defensive works. The courtyard was surrounded with a wall on the east, north, and west sides, while on the south side it was bounded by a perpendicular face of rock rising as high as the enclosing walls, and against which they abutted. Behind this the rocky hill slopes gradually upwards. The round tower was probably placed at the south-west angle of the building so as to defend the courtyard on this its weakest side. 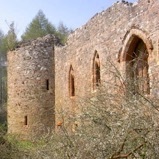 The north-east and north-west angles of the courtyard wall were strengthened with round towers, now in ruins.